Every distilled spirit has its own personality, but few are as rich in character and history as Scotch whiskey. The earthy alcohol has a reputation for robust, biting flavor, and quite a bit of burn if you’re not careful. It’s associated with high-end bars as well as boardrooms, and savored by the people who make things happen in life. Scotch scares off a lot of people with its sheer intensity, but getting to know it is certainly worth the trouble. 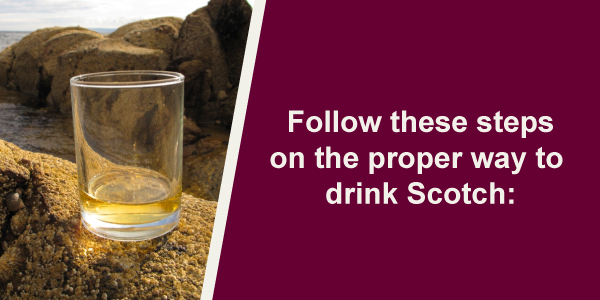 With the right approach and a little know-how, this Scotch whiskey guide can help even beginners quickly develop a passion for Scotland’s most divine draught. 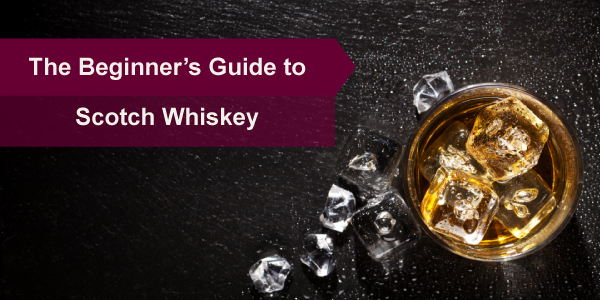 A lot of us might accept the odd whiskey-based drink and enjoy it, but the world of whiskey is pretty complicated for most to delve into it further. 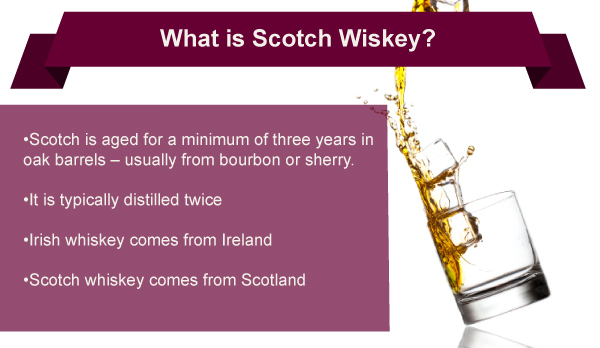 As you can imagine, Irish whiskey comes from Ireland, and Scotch from Scotland, but the differences go deeper than that. Single Malt: This variety is made using only water and barley. It must be made at one single distillery by way of batch distillation, using a pot still. Single Grain: Single grain whiskey is made at one distillery, but can include ingredients other than just barley and water. These other whole grains can be malted or un-malted. It’s important to note that the word single refers to the use of one distillery – multiple grains and cereals may be used in the production of single grain whiskey. Blended Malt: Blended malts are just what they sound like: a proprietary combination of two or more single malt whiskeys. They can be of differing ages, as long as the label lists the age of the youngest ingredients. You can identify a blended malt by the absence of “single” before “malt” on the label, and you won’t see a distillery name. Blended Grain: Because grains are relatively easy to find as well as ferment, the demand for blended grain Scotch is quite low. When it is made, two or more single grain whiskeys are combined to improve drinking flavor and aroma. Blended Scotch: This form of whiskey would win any popularity contest hands down, since 90 percent of the whiskey produced in Scotland is blended Scotch. Its creation involves combining both single grain and single malt whiskeys into a consistent, identifiable Scotch blend. Some blended Scotch brands you may recognize include Johnnie Walker, Dewar’s and The Famous Grouse. Scotland’s classification rules are extremely specific, and for good reason. The Scottish Whiskey Regulations were implemented in 2009 in order to protect the iconic beverage from being undercut by foreign competitors. Now, in order to be labeled as such, all single malt Scotch whiskey must be bottled in Scotland. Where Did Scotch Come From? Scotland’s stringent rules governing the production of its signature drink aren’t just to protect profits, they’re to protect the drink’s historical status. Whiskey has been a part of Scottish culture for centuries, and it’s been evolving all the while. The first reference we have to whiskey distilling in Scotland is in a tax record from 1494. One of the entries lists a delivery of “eight bolls of malt” to a Friar, John Cor. The record specifies that the malt was for the making of “aqua vitae,” or “water of life,” and that volume of it would have been enough to distill about 1,500 bottles. Not only does this tell us that the practice of distilling was already well-established by this point, it tells us a little bit more about the role of Scotch in society. During the 16th and 17th centuries, whiskey was distilled primarily by monks. However, due to the dissolution of their monasteries, the practice quickly spread throughout the general population. Whiskey was touted as a cure-all, good for everything from relief of palsy and colic, to the fortification of longevity. Whiskey became so popular, in fact, that it was used as political fodder for the Scottish Parliament. In 1707, the Act of Union with England drove taxes on whiskey through the roof, and the distillers went underground. 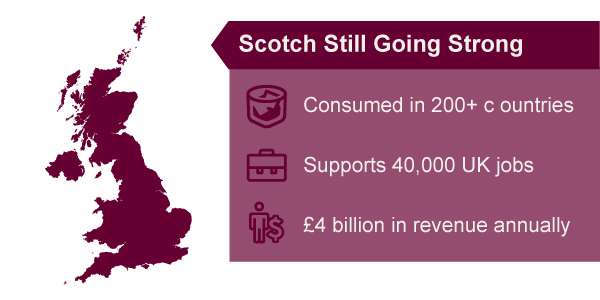 Scotch survived 150 years of taxation simply because its distillers turned to secrecy and smuggling. 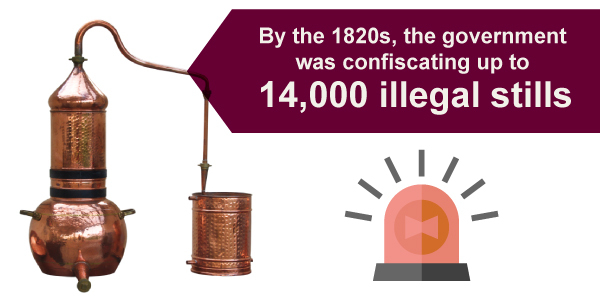 By the 1820s, the government was confiscating up to 14,000 illegal stills – but despite this, more than half of the Scotch enjoyed by the nation was consumed tax-free. That tenacity paid off eventually, when the Excise Act was passed in 1823. It allowed the distillation of whiskey as long as the government received a licensing fee of £10 and a flat fee on each gallon of spirit. Smuggling almost immediately became a thing of the past, and distillers were able to reach new heights of creativity. Before 1831, single malt was the only scotch available. But that year, Aeneas Coffey invented the Patent Still, which allowed for a continuous distillation process, and therefore the distillation of grain. Distillers were able to experiment with blending, allowing the international masses to enjoy the fierce bite of single malt with the smoothness of grain spirits. What finally catapulted Scotch to international stardom was actually the work of a surprising source. During the late 19th century, France was beset by a phylloxera frenzy. These ravenous beetles decimated French vineyards, and the world saw its supply of wine and brandy dwindle perilously. Luckily, Scotch was there to fill the gap, and quickly replaced brandy as the world’s go-to spirit. Today, Scotch is still going strong. It is consumed in more than 200 countries, supports 40,000 United Kingdom jobs and brings in nearly £4 billion in revenue every year. More than 99 million cases are exported annually. Are you ready to stake your claim on the sensation that is Scotch? Highland: The highland area is recognized more for its sheer size than for any generally shared characteristics in its Scotch. Overall, you can expect a full-bodied experience, with a moderate bite of smoky, peaty flavor. Of the many distilleries in the area, some of the most famous include Glemorangie and Dalwhinnie. Lowland: The lowlands are a good place to start for the best beginner Scotches, since they’re home to the lighter spectrum of spirits, with clear, mild floral flavors and delicate aromas. The scenic area is home to a few famous distilleries, including Auchentoshan and Bladnoch. 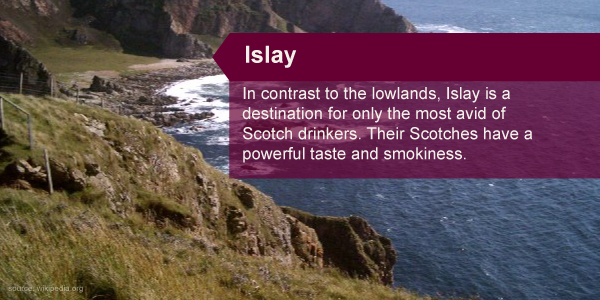 Islay: In contrast to the lowlands, Islay is a destination for only the most avid of Scotch drinkers. Its robust Scotches are packed with powerful taste and smokiness, so much so that only experienced enthusiasts are likely to enjoy them. Islay’s unique geographical location may have to do with the singular strength of flavor in their Scotch, as well as the abundance of peaty flavor. Islay Scotches are an intriguing goal to set your sights on, but their potency and price point make them risky for beginners. Campbeltown: Though it’s now home to only three functioning distilleries, Campbeltown used to be the premier producer of Scotch in the country. Even though its fortune has turned, it still remains among the ranks of the greats due to the characteristically salty or briny Scotches distilled by Glengyle, Glen Scotia and Springbank. Speyside: This region upset Campbeltown to become the top producer of fine single-malt Scotch, producing 60 percent of Scotland’s whiskey. The name comes from the river Spey, which cuts through the area and provides a constant source of fresh water to be used in distilling. Speyside Scotch is sweet and complex, and some of the area’s most famous distilleries include Glenlivet, Glenfiddich and Johnnie Walker. Malting: First things first, barley has to be turned into malt much the same way you do when brewing beer. Barley is thoroughly soaked in water, drained and spread across a floor for about a week to start the germination process – which is what turns starches into the sugar maltose. Then, the barley is dried using the smoke from a furnace. Many distilleries use peat to fuel the fire, leading to the distinctive peaty and smoky flavors in the resulting Scotch. Mashing: The dry malt is then pulverized into rough flour, mixed with hot water and allowed to steep by a machine called the mash tun. The sugars in the malt are released into the liquid, leaving us with what is called wort. Fermenting: The wort is drained off into large vessels where it’s mixed with yeast for fermentation. The yeast feeds off the malt sugars and produces alcohol over the course of about two days, resulting in the liquid called wash, which is around 5-8 percent alcohol by volume. 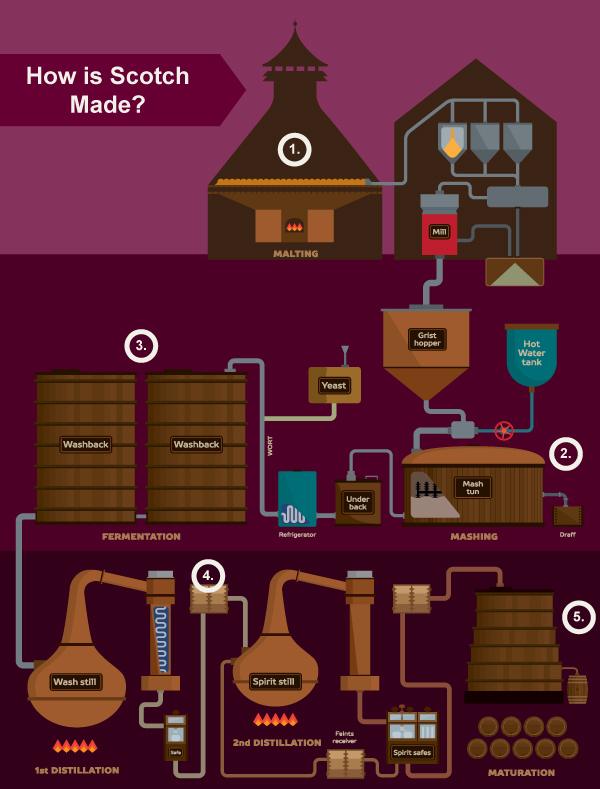 Distilling: There are two parts to distillation. The first separates water from the alcohol by boiling the wash and collecting the condensed alcohol at the top of the still, which is now about 20 percent alcohol by volume and called low wine. The low wine now goes for a second, much more closely monitored distillation where the first and last portions of the distillate are discarded to maintain purity and drinkability. Once it comes out, it’s the whiskey we know and love at about 40 percent alcohol. However, it’s still a clear liquid. Maturing: The maturation of Scotch is what gives the spirit its familiar color and flavor profile. It must be aged in oak barrels, and takes on their color over time. Different types of barrels lend different flavors, as well. Traditionally, Scotch was aged in sherry barrels, but bourbon barrels are much more common today. Some distilleries even experiment with barrels that used to hold other alcohols, like beer, port or wine. The smoothness and amount of flavor in a Scotch is usually correlated to how long it’s been aged, which is why older whiskeys tend to be more expensive. Auchentoshan: This Scotch’s name is Gaelic for “corner of the field.” It’s a great Scotch for beginners given that it’s unpeated, which means some of the intimidating intensity is missing. The lack of peat leaves the spirit more delicate and sweeter than most, with less of the burn that can scare off first-timers. The triple-distillation process also lends an extra note of smoothness on the finish. Highland Park 12-Year-Old: If you’d like to brave a bit of peat in your beginner’s Scotch, but don’t want to go overboard, Highland Park 12 is the single malt for you. It boasts a honeyed sweetness paired with a smoky aftertaste, and notes of fruit in between. It’s an excellent balance of economical, complex and welcoming to the Scotch beginner. Monkey Shoulder: If single-malt isn’t your speed, Monkey Shoulder offers an excellent introduction to blended Scotches. It errs more on the creamy side than the fiery, delivering a supple and malty flavor. You’ll notice vanilla and a bit of pumpkin pie spices with berry mid-tones that finishes with a bit of spicy oak. This triple-distilled Scotch is perfect for first tastes and developing your palate, as well as being a star in mixed drinks. Dalwhinnie: Sometimes called the Gentle Spirit, Dalwhinnie is a soft introduction to the world of Scotch whiskey. It’s an excellent Scotch for beginners because the flavor profile, while being crisp, isn’t very complex. For the developing palate, Dalwhinnie provides a light body and clear flavors of fruit, honeysuckle and apple blossom which leaves a lingering smoky finish. It’s a bit more expensive than some, but still a great candidate for best beginner Scotch. Choose a Glass: That’s right, there are special glasses just for whiskey. There are two main types favored by Scotch enthusiasts – the copita style and the Glencairn – and both are designed to narrow at the top to concentrate the aromas of the spirits they contain. The copita is based on the traditional long-stemmed Spanish drinking vessel which was used to taste sherry. The Glencairn, in contrast, has a short and solid base with thicker glass. It’s bigger at the bottom, so it can help beginners learn to swirl whiskey and open up the aromas for tasting. However, there’s nothing wrong with a regular old glass to begin with. Consider Water or Ice: Purists scoff at the notion of watering down Scotch, but there are a couple of good reasons it’s beneficial to beginners. For one, a bit of water will help disperse the harshness that many beginners balk at in their first dram. If you choose to add ice, the chill will lessen the burn that comes with Scotch. This is, of course, only advisable for your first few forays into Scotch-drinking, since it mutes the flavors and aromas that give Scotch its complexity. However, placing an ice cube or a dash of water into your glass can help you ease into fierce flavors of this spirit while you’re still finding your palate. Nosing: At this point, it’s time to introduce yourself to the scotch you’ve poured by giving it an initial nose. This involves bringing the top of the glass to chin level so you can get an idea of its aromas without any of the alcohol burn. If you’re getting any of that burning sensation, you should lower your glass slightly and try again. Swirl your Scotch around in the glass to release the aromas. If you’re using a copita or Glencairn, try holding it from the bottom – the warmth you’ll confer often frees even more scents from the Scotch. Bring it to and from your nose a couple of time, noting the different nuances that come out of the dram. Try to isolate some of the particular smells you can identify, and remember that no note is too outlandish, especially as you’re just starting out. Sampling: Once you’ve savored the nose a few times, it’s time for the moment of truth: tasting. Scotch is not a spirit to be gulped, so at first you should only take a few drops to get the most flavor. If it’s one you like immediately, you can move forward and let it permeate your tongue, and swish it against your cheeks before swallowing. If your first few drops are less than palatable, you can pause to take in a bit of air before continuing. If you’re taking notes on this experience, you’ll want to document the flavors you can identify from the nose to the main body and through the finish of the Scotch. The key to drinking Scotch is to truly appreciate the composition and flavor of the spirit, and to be able to articulate why you do or don’t like particular iterations. It’s usually relatively simple to find master tasters’ notes on specific Scotches, and use them to augment your own experience. Now that you’ve got a thorough Scotch whiskey guide in hand, you can go confidently into the world of Scottish spirits. Wine Delight is your go-to marketplace for any Scotch you can imagine, from the familiar Johnnie Walker and Glenlivet to the more exotic Lagavulin and Dalmore. Browse our extensive fine Scotch collection, and find the spirit that calls to you.